The Wait is over… the edible Easter basket tutorial is here! I know this looks hard (I was actually a little afraid of this creation. It could either turn out fabulous or be a complete disaster.) I am happy to report it turned out fabulous and is not near as hard as it looks! First you have to melt the chocolate. This is the hardest part of the whole process. There are 2 ways to melt your chocolate the MICROWAVE vs OVEN. Microwave: 1. 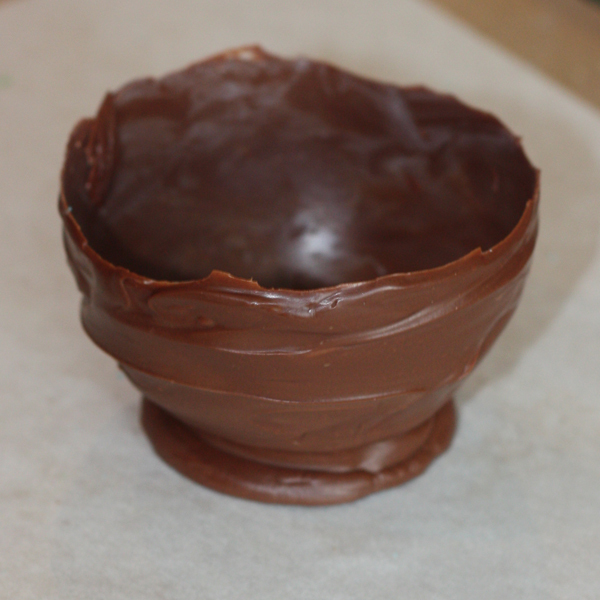 Place your chocolate in a microwave safe bowl. Microwave on half power for 30 second intervals stirring in between until chocolate is almost melted. (It usually take 3 to 4 intervals) On the last one when it is almost completely melted, give it a really good stir and you can stir out the slight little chunks of chocolate without over heating it. Oven: My Mom has been making homemade chocolates for years and she swears by this method. What is nice about this method is you can have the chocolate heating while you get everything ready. Tip: To to have your chocolate keep that shinny sheen look to it, the chocolate needs to be melted slow. 2. While your chocolate is melting blow up mini balloons and coat the bottom half of the balloons with shortening. (this will help the chocolate not stick to the chocolate) Get a cookie sheet or plate with parchment/wax paper on the it. 3. Roll the bottom half of the balloon in the chocolate, while holding on at the top half of the balloon. 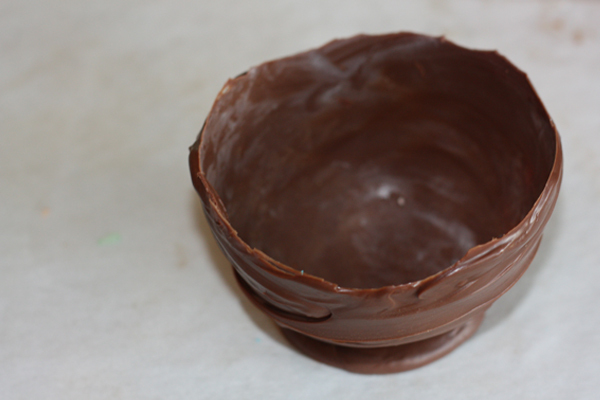 I wanted the chocolate bowl to have a little rough feel to it, since it is suppose to be a basket. No two will be alike and this makes it easier as it not suppose to be perfect. You might have to apply more than one coat. If a small area is a little transparent or you need to smooth a spot out, take the back of a spoon with a little chocolate on it and swirl in the direction of the chocolate. 4. With the balloon in your left hand. Place a small circle of chocolate on the plate/cookie sheet with your right hand. 5. Place the balloon on top of the chocolate disk. 6. Place in the freezer to set faster. 7. When the chocolate is set, pop the balloon with pin and take out the balloon remains. 8. Fill with jelly beans, chocolate eggs and other candy. Top with a bunny or chick peep. You can package them in boxes, cellophane bags or on top of individual platters at each place setting. Make sure to make these for your Easter dessert table and use with our Easter Printable available here. Would love to feature this with our Easter party tutorials (http://www.purejoyeventsblog.com/). Oh man! These are too cute. I must make them! Are your boxes 4x4x4? I think my boxes are 6x6x6. I love this and can not wait to create it with my daughter! Mackenzie the only thing I can think of is that your chocolate might be too hot! Allow your chocolate to cool just a tad (tip if the chocolate feels hot to your finger, it is too hot to dip) I hope this helps, I didn't have that problem. Let me know how it turns out!